By: Justin Zablocki (author, Zablocki Bros. LLC) on October 4th, 2013 12:00 AM. HOLMES: Watson told me you're a governess. HOLMES: Your student's a boy of 8. HOLMES: Then he's tall for his age. He flicked ink at you today. MARY: (horrified) Is there ink on my face? WATSON: No, your face is perfect. HOLMES: There are two tiny drops on your ear. Almost invisible. (trying to soften the blow) India blue's nearly impossible to wash off, anyway. MARY: How do you know I didn't punish him? HOLMES: Well, because... perhaps I should sit down. MARY: I'd like to know. Really. HOLMES: Your necklace and bracelet are matched South African diamonds from Asprey's, flawless. Not... not the jewels of a governess. The lady you work for lent them to you. She wouldn't've done so if you'd punished her son, not even if he deserved it - human nature being what it is. Mary is beet red with embarrassment. Lestrade holds up a BATTERED POCKET WATCH, by the chain. LESTRADE: This was in his pocket. Holmes reaches into his own pocket, pulls out a JEWELLER'S LOUP, screws it into his eye, grabs the watch, flips it open and examines the lid obsessively for a moment. HOLMES: Hm. A drunk and a gambler. Lestrade has no idea how Holmes deduced that. Holmes shows him the watch. HOLMES: (CONT'D) Scratches around the keyhole. Every drunk is the same. And pawnbrokers scratch the ticket number and their initials inside the lid. This one has five, so the owner made and lost money on a regular basis. 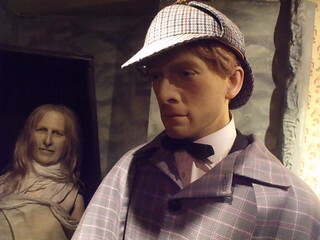 For more information about Sherlock Holmes visit the Wikipedia page. For some funny and challenging riddles visit the Funny Riddles Section.